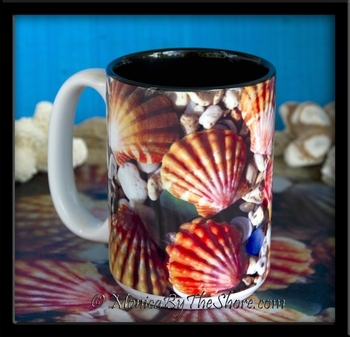 Hawaiian Sunrise Shell gift items and Home & Office Decor with a touch of Aloha from the North Shore! Seashell theme kitchen and dining room items including glass Cutting Boards, Coasters, Place Mats and Jar Openers. Beach in a Bottles decorative bottle displays for Hawaiian Seashell collections and Beach Sand in all shapes & sizes, all contain Sunrise Shells from Hawaii! Mouse pads for the office too! Create an environment of Aloha in your home wherever you live! Christmas Gift Certificates Available!!! See them here on this Page! Brand new in the MonicaByTheShore Sunrise Shell home decor collection! This vibrant textured glass cutting board is the perfect way to display the beauty of the Hawaiian Sunrise Shell in your kitchen or dining area. Use as a cutting board for meats, fish, poultry, veggies or breads. Also makes for a unique trivet for serving your favorite sushi or sushimi! The colorful seashell image is imbedded into the bottom so you never have to worry about scratching into it, and there are four rubber feet on the bottom to prevent slips & slides while slicing. Oval cutting board measures 12 inches by 9 inches. Matching place mats, coasters and jar openers are also available for a coordinating set of Sunrise Shell home decor. Made in Hawaii on the North Shore of the island of Oahu. A great gift idea with lots of Aloha! Large size Sunrise Shells Cutting Board! This vibrant textured glass cutting board is the perfect way to display the beauty of the Hawaiian Sunrise Shell in your kitchen or dining area. Use as a cutting board for meats, fish, poultry, veggies or breads. Also makes for a unique trivet for serving your favorite sushi or sushimi! The colorful seashell image is imbedded into the bottom so you never have to worry about scratching into it, and there are four rubber feet on the bottom to prevent slips & slides while slicing. Oval cutting board measures a generous 15 inches by 12 inches. Matching place mats, coasters coffee mugs and jar openers are also available for a coordinating set of Sunrise Shell home decor. Made in Hawaii on the North Shore of the island of Oahu. A great gift idea with lots of Aloha! Bring some Aloha to your workspace and enjoy the beautiful colors of our rare Hawaiian Sunrise Shells while working at your computer! Finest quality mouse pad imprinted with my original MonicaByTheShore Sunrise Shells image, for a brighter home or office decor with a little Aloha. Made on the North Shore, Haleiwa, Hawaii! Matching Sunrise Shell Coasters packaged in sets of four & Jar Openers with magnets (perfect to hang on the fridge) are available now!! Your morning cup of Hawaiian Kona coffee will taste even better in this beautiful 15 ounce ceramic mug! Colorful Sunrise Shells and pieces of blue, aqua & green Sea Glass and beach sand from Hawaii decorate this generous, high quality mug and are sure to put a smile on your face as you start your day. The interior of the ceramic mug is black so no worry about coffee stains! A great gift idea, share some MonicaByTheShore Aloha! Dress up your favorite bottled or canned drink with a colorful Sunrise Shell Coolie Cup wrap. A must have for your beach bag or any place you go & need to keep your drinks cool. Makes for a nice touch of Aloha for your office desk too. Coolie wrap closes with a Velcro strip & stores easily in a drawer, purse or pocket. Hawaiian Sunrise Shells hard case! An ultra light weight hard shell cover for the iPhone 5 made of a durable and rigid polycarbonate material, this colorful case is slim, sleek, and is the ideal blend of function and fashion for your iPhone 5 cellphone. 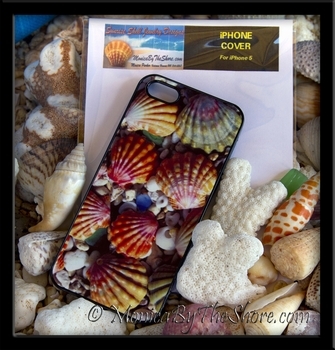 The colorful, exclusive "MonicaByTheShore" Sunrise Shells image cover is sublimated for permanent and vibrant seashells color and it is designed for easy access to buttons & ports on your iPhone. You will LOVE this case, and it makes for a great gift from Hawaii too! Matches many other "MonicaByTheShore" Home Decor items! Bring some Aloha to your home decor and enjoy the beautiful colors of our rare Hawaiian Sunrise Shells anywhere you enjoy your favorite beverage! Finest quality absorbent mousepad material imprinted with my original MonicaByTheShore Sunrise Shells image, for a brighter home environment, Hawaiian decor with Aloha. Made on the North Shore, Haleiwa, Hawaii! Matching Sunrise Shell Mouse Pads and Jar Openers with magnets (perfect to hang on the fridge) are available now!! From the MonicaByTheShore Sunrise Shell home decor collection, Hawaiian Sunrise Shell place mats! Set your table with North Shore Aloha with these beautifully colored place mats. Share a treat with your family and guests with this image of Hawaii's most beloved seashell, the rare and once held sacred Sunrise Shell. Made from the same high quality material as the mouse pads and coasters, these place mats are absorbent, non skid, easy to wash and the vibrant colors will remain bold and bright. Place mat measures 16 inches by 10 inches. I also use one to put under my computer keyboard on my desk, it matches the mouse pads! My original MonicaByTheShore Sunrise Shells image, for a brighter home environment, Hawaiian decor with Aloha. Made on the North Shore, Haleiwa, Hawaii! Matching Sunrise Shell Glass Cutting Boards, Coasters, Jar Openers with magnets (perfect to hang on the fridge) and Mouse Pads are available now! Hawaiian Sunrise Shells hard case! An ultra light weight hard shell case for the iPhone 4 & 4S, made of a durable and rigid polycarbonate material, this colorful case is slim, sleek, and is the ideal blend of function and fashion for your iPhone 4 or 4S. The Sunrise Shells image is on the back & sides of the case and it is designed for easy access to buttons & ports on your iPhone. Packaged with a microfiber cleaning cloth too! You will LOVE this case! Bring some Aloha to your home decor and enjoy the beautiful colors of our rare Hawaiian Sunrise Shells in your kitchen with this handy Jar Opener with a magnet! Hang some Aloha on your refrigerator and bring a smile to anyone who struggles with a tight lid! Finest quality thin mousepad material with gripping power, imprinted with my original MonicaByTheShore Sunrise Shells image for a brighter kitchen, Hawaiian home decor with Aloha. Made on the North Shore, Haleiwa, Hawaii! Matching Sunrise Shell Mouse Pads, place mats & Coasters packaged in a set of 4 are available! My most popular Beach in a Bottle! Hand blown glass Patron tequila bottle filled with the North Shore's special blend of beach sand, shells & sea glass, including Hawaiian Sunrise shell, Puka, Cowerie and Cone Shells and pieces. Perfect Aloha Seashell Home Decor from Hawaii, for your home or office, makes a great gift too! *SHIPS to us only, no international shipping. The classic Cuervo 1800 glass bottle makes a perfect display for this special collection of Hawaiian North Shore seashells! The huge winter waves have washed up a treasure assortment of all kinds of beautiful shells and pieces of sea glass. This great bottle is filled to the brim with Puka Shells, Cone Shells, Cowrie, Drupe, Miter, and of course the Hawaiian Sunrise Shells! The seashells are arranged atop layers of fine North Shore Beach Sand, gravel and pieces of coral. A unique Home Decor treasure for any room in the house or office and makes the perfect one-of-a-kind gift for your favorite ocean lover. This gorgeous bottle gives a natural glimpse of the gifts of the Sea from every side and soothes the soul when admired. A shimmery gold ribbon and hemp cord with dangling shells give a finishing decorative touch to the outside (not pictured). Exquisite natural beach home decor, made with Aloha on the North Shore, Haleiwa, Hawaii. *SHIPS to US only, no international shipping. The well known J�germeister glass bottle is the display for this special collection of Hawaiian North Shore seashells! The huge winter waves have washed up a treasure assortment of all kinds of beautiful shells and pieces of sea glass. This great bottle is filled to the brim with Puka Shells, Cone Shells, Cowrie, Drupe, Miter, and of course the Hawaiian Sunrise Shells! The seashells are arranged atop layers of fine North Shore Beach Sand, gravel and pieces of coral. A unique Home Decor treasure for any room in the house or office and makes the perfect one-of-a-kind gift for your favorite ocean lover. This gorgeous bottle gives a natural glimpse of the gifts of the Sea from every side and soothes the soul when admired. A shimmery gold ribbon and hemp cord with dangling shells give a finishing decorative touch to the outside (not pictured). Exquisite natural beach home decor, made with Aloha on the North Shore, Haleiwa, Hawaii. Glass Capt Morgan Reserve Rum bottle filled with the North Shore's special blend of beach sand, shells & sea glass, including Sunrise, Puka, Cowerie and Cone Shells and pieces. Perfect Aloha Home Decor from Hawaii for your home or office, makes a great gift too! Beautiful Ke Iki Beach in a Bottle! Each of my special round Oley bottles are filled with a Beachcomber 's Dream collection of Ke Iki Beach Sand (the most beautiful sand on the North Shore) and a generous variety of Hawaiian seashells. Your little beach treasure bottle will also contain bits and pieces of Sea Glass, Coral, Puka Shells, Cowerie Shells, Sunrise Shells, Cone Shells, and so many more pretty seashells unique to the Hawaiian Islands. Each 4" Oley bottle is wrapped in Hemp cord, tied with a gold ribbon and corked. Makes for a thoughtful gift, a unique Beach Wedding Favor or a nice reminder of a sunny day at the beach for yourself! Filled with Aloha, from Haleiwa, Hawaii. Click on picture to get a closer look! How cute is this! Miniature apothecary bottles filled with the tiniest of beach treasures from Ke Iki Beach on the North Shore of Oahu, Hawaii. Each bottle is filled to the brim with a layered mixture of grains of Ke Iki Beach Sand, bits of Coral, pieces of colorful Sea Glass, tiny Cone Shells, Puka Shells, Hawaiian Sunrise Shell Chips, purple Sea Urchin Spines plus an assortment of different types of Seashells and shell pieces. A Beachcomber's Treasure and a small reminder of how unique and precious our Ocean environment is. Mini bottle is 2 1/2 inches tall with rubber stopper coated with beach sand and topped off with a nice large seashell! These little Beach in a Bottle collectables make great gifts for your friends back home! Filled with Aloha by MonicaByTheShore of Haleiwa, on the North Shore of Oahu Hawaii. These Mini bottles were a HUGE hit at Haleiwa Arts Festival! Glass handle tequila jug filled with the North Shore's special blend of beach sand, shells & sea glass, including Sunrise, Puka, Cowerie and Cone Shells and pieces. Perfect Aloha Home Decor from Hawaii for your home or office, makes a great gift too! This lovely, round Chamborg bottle makes for a perfect display of the North Shore's special mixture of beachcombed treasures! This Beach in a Bottle is filled to the brim with Puka Shells, Cone Shells, Cowrie, Drupe, Miter, chunks of Sea Glass and of course Hawaiian Sunrise Shells! The Seashells are arranged atop layers of fine North Shore Beach Sand, gravel and pieces of coral. Unique Home Decor for any room in the house or office and makes the perfect one-of-a-kind gift for your favorite ocean lover. This beautiful bottle gives a glimpse of the natural gifts washed up by the Sea from every side and soothes the soul when admired. A shimmery gold ribbon and hemp cord with dangling Puka Shells give a finishing decorative touch. Exquisite natural beach home decor, hand made with Aloha by MonicaByTheShore, on the North Shore, Haleiwa, Hawaii. This beautiful Herradura Seleccion Suprema limited edition glass bottle makes an elegant display for this special collection of Hawaiian North Shore seashells! The huge winter waves have washed up a treasure assortment of all kinds of beautiful shells and pieces of sea glass. This extra large, fine glass container is filled to the brim with Puka Shells, Cone Shells, Cowrie, Drupe, Miter, and of course the Hawaiian Sunrise Shells! The seashells are arranged atop layers of fine North Shore Beach Sand, gravel and pieces of coral. A unique Home Decor treasure for any room in the house or office and makes the perfect one-of-a-kind gift for your favorite ocean lover. This gorgeous bottle gives a natural glimpse of the gifts of the Sea from every side and soothes the soul when admired. A shimmery gold ribbon and hemp cord with dangling shells give a finishing decorative touch to the outside (not pictured). Exquisite natural beach home decor, made with Aloha on the North Shore, Haleiwa, Hawaii. An extra large version of my most popular Beach In a Bottle, this giant hand blown Patron bottle allowed me to fit some super sized shells, corals and sea glass into its generously wide opening! This collection includes some jumbo Hawaiian Sunrise Shells, large pieces of Sea Glass, mature Cowrie, Miter and Cone Shells, and a great assortment of other larger seashells, Puka Shells and pieces of Coral! The larger shells are full of color and interesting texture too. Thanks to the giant surf we have enjoyed this winter on the North Shore beaches, Mother Nature has bestowed her precious gifts from the Sea in colorful piles of seashell treasure. Its a beachcomber's delight! A unique Home Decor treasure for any room in the house or office and makes the perfect one-of-a-kind gift for your favorite ocean lover. Original, natural beach home decor, made with Aloha on the North Shore, Haleiwa, Hawaii. Add some Hawaiian Aloha to your glass of "Bubbly" or your favorite wine with these adorable Sunrise Shell & Gem Stone sterling silver Wine Glass Charms! Each wine glass charm in this set of 6 charms is unique! The Baby Sunrise Shells are all different and each one is strung with sterling silver wire onto a sterling silver charm ring. The assortment of gem stones include Fire Opal, Peridot, Citrine, Pearls, Pink Branch Coral, Swarovski Crystals, and also North Shore Puka Shells and Cone Shell. And just in case your guests get a little too happy & drop their glass, the Sunrise Shells have been coated with a clear resin to add strength and durability to the shell for many years of festivities! Your guests will LOVE these unique charms! Makes the perfect gift for the hostess who has "everything"! A MonicaByTheShore Hawaiian Sunrise Shell original creation, hand crafted with Aloha on the North Shore in Haleiwa, Oahu, Hawaii. These vibrant, colorful cell phone "Skins" feature my most popular Hawaiian Sunrise Shell image! Vinyl adhesive skins fit the iPhone 4G & 4S. A unique cell phone accessory! Another MonicaByTheShore original design, from the North Shore of Oahu, Hawaii. A beautiful Hawaiian style cell phone cover that is in-between the Skin & the Hard Shell Case, the new Sunrise Shell "Gel Skin" gives your iPhone a completely custom 3-D look! Offering cushioned protection with style, Gel Skins are cushy soft & comfortable to hold too! Enhanced, eye-popping graphics will not fade and the resin coated Gel Skin is scratch resistant. The adhesive Gel pads can be removed and transferred to another iPhone easily too. Keeping the Aloha of the Sunrise Shell in your hands with another MonicaByTheShore designer cell phone accessory! Cover your iPad with Aloha! These vibrant, colorful iPad "Skins" feature my most popular Hawaiian Sunrise Shell image! Vinyl adhesive cover skins fit the Apple iPad front frame & back, provide protection from scratches & will make your Original iPad so much happier! Not cut for camera. * SOLD OUT * Sarongs from Bali ~ Hand Batik-ed in a variety of beautiful styles including solid rayon, rayon with cutouts, sheer, embroidered, and hand beaded. Full sizes and half sizes. Each one a unique design ~ the finest quality to be found in Bali. 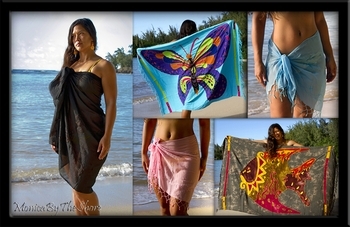 The perfect wardrobe choice to accessorize your Sunrise Shell jewelry, or use your Sarong as a wall hanging, table cloth, curtain, bedspread or beach blanket! Only ONE available of most designs! CLICK TWICE on photos for a closer view! E Komo Mai! Come, follow along with me on a journey off the beaten path through the beautiful islands of Hawaii. Explore the rough, jagged coastline, enjoy the tenderness of a roadside wildflower, hear the thunderous crashing of giant surf and watch the sunset over the ocean in a blink of eye. I'll take you under the waves to swim with sharks and we'll hike out onto the rocks to lay with monk seals. 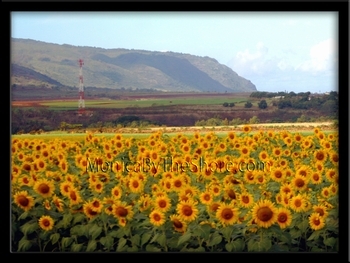 Waterfalls, rainbows, seashells and sunflowers ... lets share it all in my Hawaiian photo gallery. Nature photography with aloha. All photographs are 8x10 matted prints. Matted photos of other sizes, up to 20 x 24 and including canvas giclees can also be ordered, please email me or call me. As of October 2010, MonicaByTheShore Photography is proudly on display at Thomadro Art Gallery in the heart of Haleiwa Town, North Shore, Oahu, Hawaii! Canvas gicless in several sizes too! Mele Kalikimaka from the North Shore! Give some warm Aloha to someone special with a personalized "MonicaByTheShore" Sunrise Shell Jewelry Gift Certificate. Available here in several amounts, or email me to request a specific amount you would like to give. Applies to any merchandise on the website or can be used toward a custom design! Includes a personalized and printable Holiday card with a coupon code to be used at checkout. Can be used immediately, good for one year! * CLICK on the photo to see the page with all the different gift amounts! A great idea to give to your friends and loved ones who would like to pick out their own unique Hawaiian Sunrise Shell from the North Shore, Haleiwa, Hawaii!